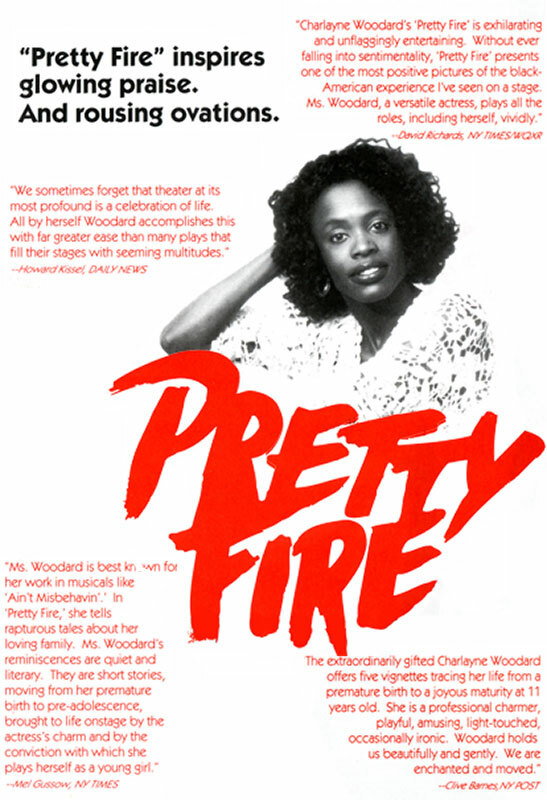 "Pretty Fire," presented by the Manhattan Theater Club, has reopened at the Kaye Playhouse at Hunter College, 68th Street (between Park and Lexington Avenues). Emerging from her secure, middle-class background with her individuality intact and with her imagination nurtured into creativity, Charlayne Woodard has turned her early life into a vivid one-woman play. In "Pretty Fire," she offers audiences intimate entree into formative experiences. Ms. Woodard is, first of all, a singer and an actress, best known for her work in musicals like "Ain't Misbehavin."' In her memoir-as-play, she tells rapturous tales about her loving family, a gratifying change from stories of urban violence and despair. Relatives remained close despite geographic distance. Her parents lived near Albany, her maternal grandparents in the Deep South, where Ms. Woodard and her younger sister spent long bucolic summers and learned grandmotherly wisdom. From an early age, she was infatuated with thoughts of Dixie. Disillusionment followed a sudden, rare encounter with racism. The reminiscences are quiet and literary, short stories brought to life onstage by the actress's charm and by the conviction with which she plays herself as a young girl. Even when the stories are not entirely eventful, they retain their poignancy, and she saves her most evocative memory for last. This is the day when, fulfilling a grandmother's wish, she rises to sing a solo with the church choir, and the modest, self-effacing child discovers herself as a performer. That moment was transforming, giving Ms. Woodard a feeling of her singularity and her power to move an audience. Pamela Berlin has staged the monologue with simplicity and clarity, and Ms. Woodard performs with a generosity that must derive from self-knowledge.